Can you see it? The tents, animals and acrobats of the circus. Can you hear the music? If not, then you probably don’t believe enough in the magic. Micah believes and so does Grandpa Ephraim, but Jenny, well, some, maybe, sometimes. She tries, but then, she is almost eleven. 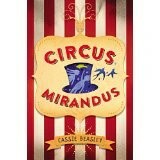 Circus Mirandus is a special kind of circus. It has been going on without interruption since 500 BC. It can move without being seen and is capable of opening portals between our world and its. Magic and miracles are things we all need in life from time to time. But is it always available when we really need it? Do we know how to recognize it? Do we dare ask? These are some of the questions Micah faces throughout the story and our readers will wonder, too. Cassie Beasley’s debut novel will take you from the doldrums of everyday life and open your eyes to the possibilities around you. Hope, humor and optimism carry the story along from one adventure to another. Micah lives with his Grandpa, but is now face to face with Grandpa’s failing health and imminent death. Aunt Gertrudis has come to help take care of them and she has no time for the nonsense of magic. This is a marvelous tale of unexpected friendship and ingenious planning to accomplish dreams. Fifth grade readers and sixth grade readers will enjoy reading it on their own while fulfilling literacy skills. Librarians and teachers will want to include it in their collections for students to have a chance to read it before the movie comes out. crossover concept on A Bird on Water Street plus an interview and a GIVEAWAY! admin on A Bird on Water Street plus an interview and a GIVEAWAY! Elizabeth Dulemba on A Bird on Water Street plus an interview and a GIVEAWAY!